“It’s a boy!” announces the nurse in the delivery room. Tears, smiles and hugs all around. The arrival announcement may be done but the words of advice are just getting started. “On his first birthday make sure to have chocolate cake with a little tractor theme. Send him to preschool as soon as he is allowed. Make sure he wears the brand of shoes that the other kids are wearing so he fits in but doesn’t stand out. He should go to a Christian elementary school and be sure to get him into the most prestigious Christian high school in your community,” she continues. I’m sure you’re wondering what nurse would dare tell a parent exactly the steps that they should take when raising their child minutes after the delivery. A little help now and then upon request is welcomed but not every tiny detail as to how to plan every move of his life! However, that is sometimes exactly what I do to God. I know that He has a plan but I get a little anxious about it. I’m afraid He may not do it right so I give Him a few pointers as to how I think things would work out best. The Bible tells us to pray without ceasing. It tells us God knows the desires of our heart. He wants us to have a close relationship with Him. Well, then, I don’t think it hurts to give a few suggestions on how I think things will work out for the best. Just as it is silly to think of a nurse telling the parents all the details of what they should do for their child’s life, it’s just as silly for me to think I can tell God, the One who created me and all of the people on this entire universe, what I think is the best way to handle situations. This entry was posted in devotional, inspirational, motivational, spiritual on April 30, 2018 by Deanna Young. All questions from the orthopedic doctor trying to determine if something was wrong with my shoulder. Conclusion was that the weakness in my arm was not coming from my shoulder but perhaps from degeneration of the vertebrae in my neck. An MRI will be needed. Now for those of you who don’t know me, an MRI scares me to death. I am claustrophobic and small spaces make me start to hyperventilate. I’ve had MRI’s because of two shoulder surgeries but I’ve had to take meds to calm me down before I go into that tube of terror. Dr. Rolf knows me well so he allowed me to try some anti-inflammatory meds to make sure it wasn’t just inflammation. Almost two weeks after that appointment and several days after the steroid pack, it’s no better. 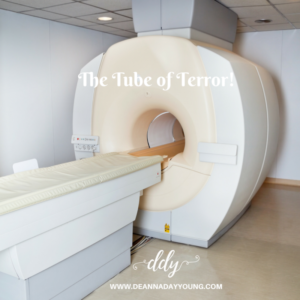 My arm seems to be getting weaker every day so I am going to have to go into that big scary tube! I know it’s necessary because the weakness doesn’t allow me to use this arm and pick things up with any confidence at all. As I was worrying about it this morning (along with all the other worries of the day), I opened my Bible to Isaiah 40:29-31: He gives strength to the weary and increases the power of the weak. Even youths grow tired and weary, and young men stumble and fall; but those who hope in the Lord will renew their strength. They will soar on wings like eagles; they will run and not grow weary, they will walk and not be faint. 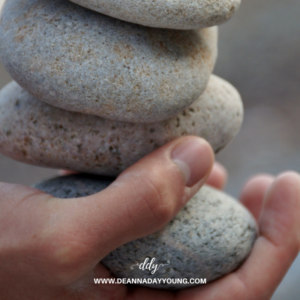 Just like the pinching of the nerves in my neck may be causing my arm to be weak, so does the pinching of worries in our lives cause our faith to lose strength. There are doctors to help our physical weaknesses and there is a Great Physician to help us with our spiritual weakness. God, through His Son, Jesus, and the Holy Spirit can bring strength to the weak and hope to the hopeless. I’m done worrying about the scary things of life. I can’t control people and I can’t control circumstances but God can and today, I ask the Doctor of Life to take away the pain of my worries and the hopelessness of my weakness and fill me with joy and strength. Let’s strive to let God handle the weakness as we build up our spiritual strength by drawing closer to Him every minute through prayer and faithful living. I’m getting ready to go into that tube of terror called THE WORLD but I know that God is good and will help me find strength. Oh, and with a little help from some calming meds, I know I can take on that MRI tube of terror also! This entry was posted in devotional, inspirational, motivational, spiritual on April 27, 2018 by Deanna Young. UGGHHH!! The frustration of having to slow down while driving on the two-lane road for the OVERSIZE LOAD coming your way! You know what I’m talking about, don’t you? The little truck coming at you with a banner across its grill with what seems like a 70-foot bicycle flag waving in the wind announcing the approaching oversize load that will take up its side of the highway and 3/4 of your side. There’s just something about that oversize load that aggravates me. It interrupts my smooth flow of driving. It’s annoying that I have to slow down and share my legal-right-of-way with some larger-than-life piece of equipment or motor or water pump. Then I started feeling guilty about my selfishness of the 15 seconds of interruption on my route. Whoever is getting that new John Deere® tractor is going to be one happy farmer. And whoever is just about to receive their new home or big ole boat is really going to be excited. And whatever electric facility that is receiving that humongous motor will be able to provide electric to a ton of people. How selfish of me!! And then I started thinking about the blessings that we receive everyday. God is flowing down oversize loads of blessings every day for us and we get aggravated because they stop the natural flow of our day. Heading out the door late for work and spill coffee on your skirt only to realize the skirt had a rip in it and you would have had a pretty embarrassing day had you not noticed before you left. Hummmm thank you Lord for that blessing in disguise. I could go on and on with examples but you get the idea. Today I am going to try to look for the positive in the aggravation and see what oversize blessings God is giving me today. I don’t want to miss them but sometimes He has to hold up the banner and wave the bicycle flag to remind me that an oversize load of blessings is coming my way. Thank you, Lord for my oversize load of blessings! This entry was posted in devotional, inspirational, motivational, spiritual on April 26, 2018 by Deanna Young. Hold It. Throw It. Or Drop It. People have used this phrase for decades as a defense mechanism letting the world know that they are tougher than any harmful words thrown at them. It convinces others that people’s hateful attitudes will not break their spirit. 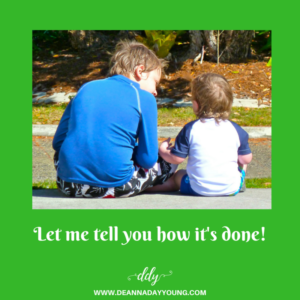 I bet you are saying it over and over to yourself right now and shaking your head in agreement! But have you ever been the one throwing the stones? Social media has increased the platform a thousand times over for opportunities to throw stones at others. People hide behind the mask of a computer, a cell phone or a social media app thinking that they have the right to say whatever they want giving no second thought to the consequences of who is on the other side of their own technology screen. We are on guard with the stone clinched tight in our fist just waiting for someone to disagree with our views on politics, religion or climate change. And then we rare back and throw it. Hateful words. Judgment. Name calling. And there it goes. A stone straight to the heart that lands deep within the pit of the stomach. Oh we think we feel better because the other person got what they deserved. But getting what we deserve is not what God had in mind when He sent His Son to die for our stone throwing. God wants us to drop our stones and let Him handle the job of making the situation right – right to bring honor and glory to Him. It’s hard not to fire back when someone hurts us. But thank goodness God does not give us all what we truly deserve. Thank goodness God is not in the stone throwing business. I have a challenge for us all. What if just for this month, just for this week or even just for today we decided to drop our stone, not respond but rather trust God to handle each stone throw that comes our way? What if we just slowly released the hold, let our fingers relax and listen for the thump of the drop? Will you hold it, throw it or drop it? It’s our choice. This entry was posted in devotional, inspirational, motivational, spiritual on April 22, 2018 by Deanna Young.